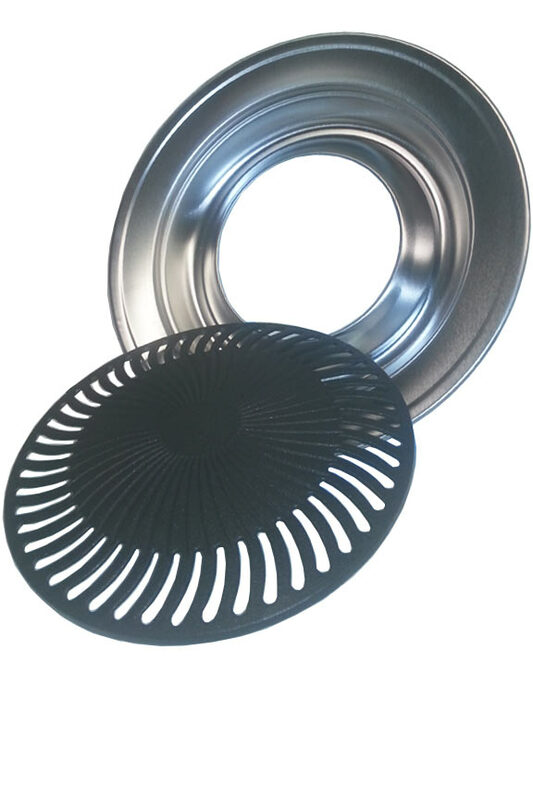 The stainless steel drip pan on our stove top grill serves several purposes. It supports the actual grill pan, collects all of the drippings from the food you are cooking, and also can be used to steam flavor into your food. You will want to fill the outer ring with water anytime you cook, but you can also substitute, or add in juice, wine, beer or marinade to steam additional flavor into your meat or vegetables as you grill. This results in perfectly cooked food every time because you are adding moisture to the interior as the it is crisping up on the outside. This means that you always get juicy flavorful food, and you never end up with tough or chewy meat. The clever design allows excess fat to drip down to eliminate smoke, prevent spatter, reduce the amount of unnecessary calories you ingest. The added liquid in the ring not only prevents your food from dying out, it also makes clean-up easier since grease and fat won't get cooked on. This versatile grill can be used on almost any stovetop. It will work on both gas and electric ranges, and it even works on smooth glass top ones. You can also use it on propane stoves, outdoor grills or camp stoves too. You just need to have a sturdy, level surface with a heat source underneath. The time it takes for this stove top grill to heat up and be ready for use will vary depending upon surface, but you can achieve perfection no matter which style range you have. Glass surfaces will take the longest to heat it up, and anything with flames will heat it up the quickest. Step one is to locate the spot where you will cook. Smaller burners are usually better so that all heat remains inside the ring. Larger burners can make it more complicated by adding heat to the outer ring. Ouch. Place the ring down on your cooking surface and add moisture to the ring. Always use water at the least, but add juice, alcohol or marinade to add flavor as you steam in moisture. Once moisture is in the ring, put the grill plate on top and ensure it is level and secure. Once the stove top grill is assembled and prepared, turn on the burner to a medium setting. Once you use it a few times, you will be able to determine the correct amount of time for your exact set up. To test the pan for readiness, simply flick a few drops of water onto the surface, and if it dances around, you are ready to cook. You always want to start with the grill over medium heat and then adjust after it is ready depending upon what you are cooking. Once the unit is set up properly and heated all the way, you are ready to cook. When grilling , you will want to cook food similar to the way you would on an outdoor grill, as far as cooking times and methods are concerned. To increase the steaming action, and infuse more flavors, add a pot lid over your food as it cooks. This will lock in heat and moisture to increase speed without decreasing enjoyability. It is even oven safe, so you can use it to bake low-fat meals like meatloaf, roast chicken, roast beef, pork chops, or place it under the broiler to cook salmon or halibut. This is one of the quickest and most healthy ways to cook meat or vegetables that taste amazing. Start eating healthier, better tasting food when you cook with this stove top grill. It allows you to enjoy that grilled taste without all the hassle. You end up with a low fat meal that is full of flavor, and you never have to refill propane tanks, stack dirty charcoal or even go outside. It will always be ready when you need it, so you can enjoy flavorful food, anytime you feel like it, without using a big bulky grill. It would be perfect for any kitchen, but single people, elderly couples, apartment and condo dwellers and others can especially benefit from a cooking surface like this one. It is super easy to use and thanks to high quality parts, it will last for years. Don't be fooled by low quality stove top grill alternatives. This one will work better and last longer than any other similar model out there. Those lower cost options will flake and chip after only a couple uses, and the grill surface does not even provide even heat when new. More expensive options may look more impressive, but your results will probably not justify the price increase. Those ones don't add moisture or flavor as you grill, so you may end up with food that is tough to chew. Flat grill pans will brown food on the outside, but they leave little room for fat to drip away. This one is highly affordable, but you get a lot for your money. It is guaranteed to offer a healthy way to quickly cook mouth watering food, and cleaning it up afterward is easy too. Both the stainless steel drip plate and the non-stick grilling surface are dishwasher safe, so just pop them in, turn it on, and the cleaning is done. You will never need to scrub or scour to get this thing clean because the high quality surface lets food slide right off. As an option, we do recommend hand washing with warm soapy water for maximum longevity, but it is not required. Each one comes complete with a detailed instruction and recipe book. Order Yours Today! Overall Size 13" x 13"
Stove Top Grill - The great taste of food cooked outdoors without stepping foot outside. Convenient and easy to use, this stove top grill makes cooking fast and healthy. Order Yours Today. This type of grill works GREAT - especially for quick meals for 2. The meat cooks the same as on an outdoor grill - no guess work. It's the Best. I LOVE IT!!!! I had to get rid of my big grill - can't lift the propane anymore. I missed grilling so much. This is absolutely perfect. Love the easy clean up. Love how easy it was to cook on this stove top grill! None of the food stuck to it, and the food came out perfectly cooked and moist! Cleaning was a snap! This is a sturdy item and much better quality than the cheaper, similar items. It has a deep water/liquid ring that is easier to work with. The grill is fine quality and leaves a beautiful design on fish and meat! I bought the stovetop grill for a Christmas present. I ordered late, but it arrived the day before, just like it was supposed to. The grill goes over one burner of our propane stove. It cooks the food like a grill would with stripe marks and all. The only drawbacks we've seen are its fairly small, so you can only cook a few pieces at a time, and it doesn't get as hot as it needs to for thicker meats (where you would normally put the lid down.) Easy clean up! Love the convenience of "grilling" on my stove! Chicken was delicious! And my house a wonderful fresh cooked aroma! Your stovetop grill is the best. I use it several times a week. Because I like to cook with it so much, I have gifted it to my daughters and friends. They also enjoy using it. Thank you for this product! I am very pleased with the new grill. It is easy to use and the meat grilled on it has a good flavor. It is also to clean. I have ordered another already as a gift. THE NEXT BEST THING TO BEING OUTDOORS! Marvelous invention! I can grill in my kitchen; no smoke (if you follow directions) and easy to clean. For more than two people of course you need another Grill. I think one for meat and one for vegetables would be a good idea. I highly recommend it. This grill is so much better than the knock off ones.. Food doesn't stick, nor does the finish peel off. Great grill for indoors. Easy to use and clean. So far, after five uses, it has functioned well as claimed. Very convenient specially when it is cold outside as one wouldn't have to go out and fire up the barbecue grill. Don't let its looks and weight fool you, after all it is made of aluminum. It should last a long time with normal use. We have greatly enjoyed the stove top grill. It works as advertised, No Smoke. We have enjoyed several steaks grilled on this grill. I found this grill thru a youtube review??. I was shopping for one just like it & found it much cheaper in other places but the horror stories i heard about the cheaper ones made me choose this one. The cheap ones have non-stick finishes that rub off while cleaning. This one doesn't. Its so easy to clean & use. Im so pleased with this grill & recommend it to everyone. I even bought one for my sister. Get this grill! U won't regret it ?? I absolutely love my grill, I've talked about it so much I ended up buying 4 more for friends and family! Great product and my food taste great. Or two, for bigger cooking jobs. This is by far the best kitchen gadget I have seen in years. Easy clean-up. Food comes out great! I love it. Besides grilling my steak to perfection, it did not splatter AT ALL. Easy clean-up on the grill and my stovetop. I am very happy with my stove top grill. Thank you for your inquiry. Simply amazing! Cook time is not long and cleanup is very easy. I purchased 3, one for myself, my mom and my sister and they also absolutely love it. I am in the process of purchasing 3 more, one for my daughter and other family members who are dying to try it! Every one makes mistakes... This thing is apiece of crap..Don't buy it use a skillet, same results ! ! ! Excellent product for the price, easy clean up, and it works like a dream. Will order another for a gift. I used this grill for the first time this weekend and it worked great! Was able to cook 4 quarter pound burgers with ease. Clean up wasn't too bad either. I bought this to use camping on the outside stove rather than having to lug along another grill. Very happy with the results. 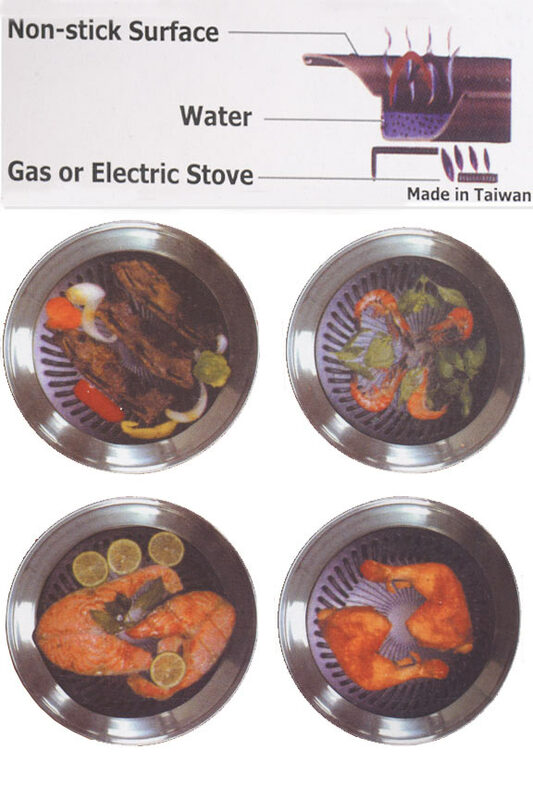 Excellent product, I love my Korean stovetop grill , and timely delivery. Thanks!! If any other widgets come about on your site that I may have a desire to buy, I'll be ordering. I really wish that the stovetop grill was around twenty years ago here in the states. It's been a real hit with get-togethers. I do not like it. Put chicken Breast On it and barely gets hot enough to cook. U would have to wrap completely in foul maybe to get hot enough. Dont have time for the looonnggg wait on cooking meat. Wasted money. I will go back to George Forman grill. A friend had one like this and showed it to me a while back. I read reviews online and felt this was the one I wanted. Have used it for shish-kabobs, steak, shrimp, onions, bellpeppers and other veggies. Plan to use it a lot more. It works well and is easy to clean. I recommended it to my daughter, too. I have a gas range I use it on and am quite happy with the results. So glad I bought it! I love the taste of grilled food, but don't want to go outside and fire up the big BBQ, especially in the winter. did not work as well as i thought it would...should have known that the lines on the steak on the advertisement were not the lines on the pan. will try it again sometime. I didn't think this would work as well as it does. I use the center burner on my gas stove. It heats up fast. Easy to clean up. The meat stays moist due to the water required in the drip pan. Love this grill. It's even dishwasher safe. Feels very well made too. If you're considering it, def buy it. However the flame does not rise out of the grill slit area ever. That's for the heat release. I originally thought it would grill thru the grate and it doesn't. Still great cooking item. Takes my cast iron pan out of the game. Fixed pork chops and hamburgers and they turned out great. Had good grilled taste. There is no official "Brand". Although it is high quality, no fancy name has been attached to make it cost more money. Generic branding allows us to sell a better product at a lower price. You may have seen similar products under the Grill It, Burton or Beyond Limits brands, and they claim to be worth upwards of $50. You will find ours to be just as good or better than any other similar looking unit available. Don't let the reasonable price fool you. 25 of 32 Customer(s) found this Answer helpful. I have tried making chicken 3 repeated times on this product , yes on the smallest burner , on my glass top cooktop. Chicken just turns out poorly ..I tried waiting for it to great a while ,higher heat,lower heat,just not making it happened.Help? Glass top stoves will take the longest amount of time to heat the grill plate. If you begin cooking before it is hot enough, you will not be happy with the results. Use medium or medium-high heat, and pre-heat the grill all the way prior to putting your chicken on. To test for heat, simply get your hand wet and flick a few drops of water onto the center. If it dances, sizzles and then turns to steam, the surface is ready for grilling. If the water sits there calmly, or runs to the outside, it needs more time. If you wait until it is ready, you will be happy with the results for sure. To speed things up, set the burner to high while prepping the pan, and then reduce to medium once it is ready, and before you put the chicken on. Doing this will cut the wait for your type of range, but make sure to wait a minute to let the temp regulate after you lower it. 21 of 23 Customer(s) found this Answer helpful. CAN I GET A RECIPE BOOKLET? Sure. Give us a call, or email your shipping address, and we would be happy to send you one. In the mean time, you can find most of the recipes on our site by using the following links. 7 of 7 Customer(s) found this Answer helpful. do you cook steaks to your regular time frame or do you have to do it some other way? As long as it's preheated, and set to the proper temp, the timing should be the same. Go here: http://tips.simplygoodstuff.com/howto-cook-steak-on-the-stove/ for more information and detailed instructions. Does the stove top grill work with an induction stove? It will take longer to heat, but yes, you should be able to use it with this stove type. Hello, We just purchased this and love it. Is there a larger size? Glad to hear you like it. At this time, there is no other size option. What kind of surface is the top portion made of if it is non stick and can you use a metal spatula? Yes. 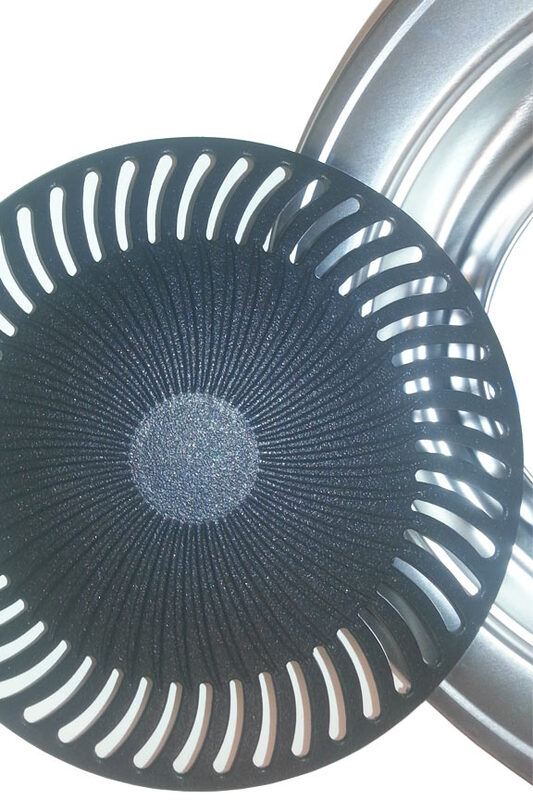 It is a non-stick surface similar to what you would find on other cookware. You should not use metal utensils because they can scratch, wear down, and/or damage the surface over time. To use it in your oven, just slide it in and position right on the rack. For cooking chicken, 325-350 is a good temp. what material is the cook surface made of? 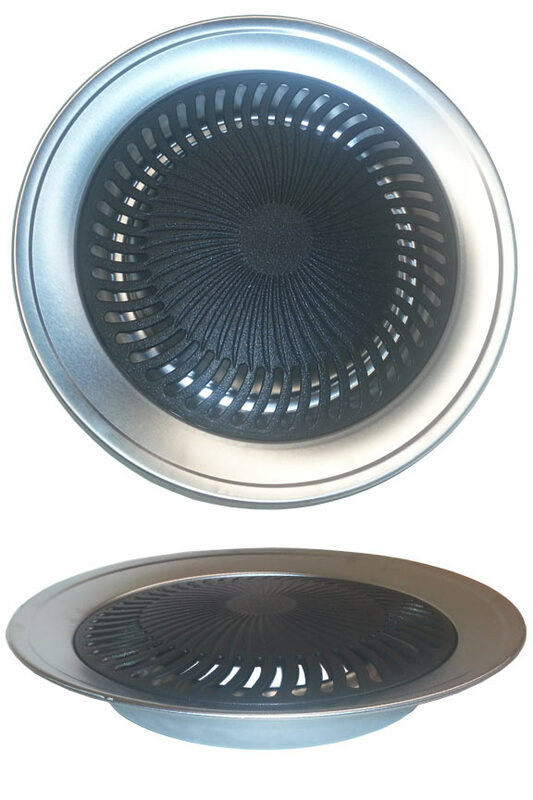 The grill plate is aluminum with a PFOA-free, non-stick coating. I want to use this grill to cook salmon on the outside grill but that grill gets up to 600 degrees. Will that temperature destroy the grill? Six hundred degree heat will likely destroy your fish before it hurts this product, but sustained temperatures that high could result in damage to the non-stick surface. Most outdoor grills cook at temps less than 400 degrees, so you may want to double check yours, or just cook using a lower setting. Is this product smokeless? I would be buying for someone in an apartment building where smoke alarms are sensitive. Yes. It is smokeless, and safe for indoor use in virtually any situation. I bought a grill it, stove top grill at the Southern Christmas Show in Charlotte, Nc this past weekend.The grill will not center on the smallest burner. It is a ceramic stovetop n the burner is too close to the back of the stove. How do I get a refund? Sorry to hear of this problem. Unfortunately, it was not our company at that show. You will need to contact the venue or promoter to find out who sold it to you. I may have missed it, but is there a recipe book available (in addition to the info that came with the unit)? I am not a cooking guru, but we had NoName steaks on this tonight and they were great! After the winter we are experiencing - we all yell and dance around when the forecast is above 0, this will be so nice to have until we can grill outside!!! We do not have anything more than what we include with each unit, but you can certainly make anything that you normally cook on an outdoor grill. You can also adapt some of your favorite indoor recipes to save time and make them more flavorful. Checking on size: already own a Burton, whose grill section comes to rim of drip pan; total diam. 14". Am very happy w. grilling process, but size is tricky - sometimes tips over on burner, spilling H2O, etc. So am looking for a smaller one -- yours? It sounds like ours is slightly smaller. Total diameter including the outer ring is 13 inches. The actual cooking surface has a 10 inch diameter. can this product be used on a charcoal grill (like a weber)? Oh yeah. It works great for that. Can this be used for making Indian rotis? Yes. You should be able to use it for that without any trouble. Can I buy a new grill part for the grill? This part is not available separately at this time. Sorry. Is it safe to use in a hot barbecue for megetables while meat is grilling? Yes it is. Just be careful when removing it because the whole thing will get hot. Does anyone know if I could use rubbing alcohol to clean this? (only answer if you know what you're talking about). Can we use stove top BBQ grill on a glass top stove? Yes. It will take longer to pre-heat, but once up to temp, it will work just fine.